I've been practicing for a few days with a new-to- me technique so I haven't gotten anything posted since Monday. Last night I sat down to get started on today's project and I got far enough along that it didn't take too long to get it finished up this morning. 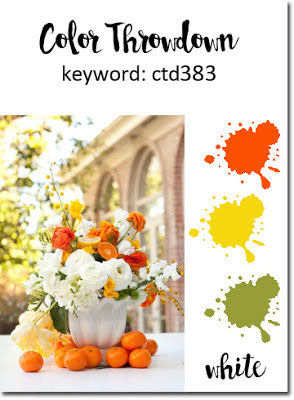 For today's card, I am playing over at the Color Throwdown Challenge #383 which is yellow, orange, green and white. I knew I had the perfect Stamp to participate in this challenge. I love the bright summery colors in this inspiration image. I started by heat embossing the WPLUS9 Beautiful Bouquet Ranunculus with Simon Says Stamp Antique Gold Embossing Powder on a Canson Bristol Watercolor Panel. I've really learned how to control the amount of water I use in order to get the look I want in Watercolor. I'm probably not doing it right technically. but I'm okay with that. To color my image, I used a combination of Zig Clean Color Real Brush Pens in Bright Yellow, Orange, May Green, Green and I used Festive Berries and Mowed Lawn Distress Markers for a few of the leaves and the berries. I am so satisfied with the results of these two mediums and I think learning to watercolor has given me a new appreciation for colors outside of the blue based tones I love so much. Yellow or orange is not the first choice I would normally make when doing a bouquet, but I love how this came out. I actually only have one orange in my colors, so I'm glad it worked out. For the sentiment on this card, I used one of the greetings in the Tulip Time Stamp Set from Papertrey Ink. I die cut the panel using a Simon Says Stamp Stitched Rectangle in the largest size and mounted it to an A2 card base made from Simon Says Stamp 100# Orange Peel Card Stock. I don't normally buy orange card stock but it was one of the colors in the Simon Says Stamp Rainbow Pack which has two sheets each of several different colors. Once the water coloring was completed, this was a quick-to-assemble card. Have a great day everyone! I love comments if you'd like to leave one for me. I have more projects coming up this week, so I will be back soon. So pretty and reminds me of the reason I got hooked on stamping when I first used gold embossing powder! Thanks so much for playing along with us at Color Throwdown! Lovely flowers and the sentiment in gold is gorgeous!! So glad you joined us at CTD! This turned out beautifully! Love the gold embossing and your watercoloring is great! Thanks so much for playing along with us at the Color Throwdown! Simon Says "We Can See Clearly"